Hemingway Marooned at Fort Jefferson! The famed author considered himself a dedicated hunter and fisherman. However, until the age of 30 he had never experienced the art and the thrill of deepsea sportfishing. This is what happened. 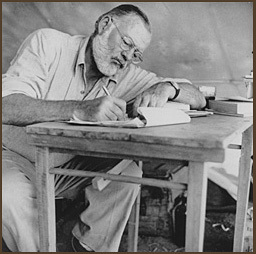 Hemingway spent the years from 1928 to 1940 as a part-time and permanent resident of Key West. Many consider those years the most important of his tumultuous life. They were the years when he wrote hard and played hard. And Indulged his passion for sportfishing in waters around the Marquesas Keys Atoll, the Gulf Stream, and the Dry Tortugas. Hemingway soon met Charles Thompson, native and owner of a hardware store on Carolina Street, who loved to fish and hunt. Ernest's first sportfishing foray was a week-and trip with Charles to the Marquesas, 30 miles offshore, on a boat captained by Bahamian "Bra" Saunders. Ernest was ecstatic -- he was finally fishing in the Gulf Stream for sailfish, swordfish, tarpon, and marlin. They fished each day, dined on snapper and yellowtail and raw conch salad while docked evenings in the Marquesas. Soon thereafter Charles and Ernest planned an extended fishing trip to the Dry Tortugas in the Stream 70 miles west of Key West. This time with a group of friends Ernest called his "Mob." They were artists Mike Strater and Waldo Pierce, boyhood friend Bill Smith, and writer John Dos Passos, all out-of-towners; plus local saloonkeeper Joe Russell; charterboat captains Hamilton Adams, Eddie and Burge Saunders, and Jakie Key; newspaperman Earl Adams; machine shop owner J. B. Sullivan; and of course Thompson. Maxwell Perkins, Hemingway's editor at Scribners Magazine, joined them later. The first excursion was cut to a weekend by the threat of a major storm. Subsequently the Mob gathered for three more fishing seasons making the ten hour trip to the Dry Tortugas by way of the Marquesas. The last outing of the group, however, turned out a bit differently. The trip was planned to last a week, but a strong tropical storm moved into the area and the Mob was marooned at Fort Jefferson for seventeen days. Fortunately their supply of canned goods, coffee, and liquor lasted almost the entire time, though at the end they were reduced to depend on fish before they could safely return to Key West in their small fishing boats. Over the following years Ernest Hemingway and his Key West friends continued to fish the Marquesas Keys and Dry Tortugas. But the wild and wonderful days of the original Mob became memories that none forgot. Today, thanks to modern high-tech communication and high-speed ocean catamaran ferry service, there is little likelihood of anyone being marooned anywhere in Dry Tortugas National Park.